African crafts for children are a great way to teach young ones about African life and history. The African continent has a rich tradition of colorful and ornate crafts made by hand and sold in markets to locals and tourists alike. Here are three great projects you can do with your children at home. Like all continents, Africa has a long history of struggles and achievement. One of the most popular remnants of these battles is the warrior mask. 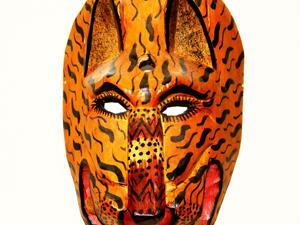 These masks were also carved to mimic animals and were used in spiritual practices. Today, you will often find replica carved wood masks sold for their unique beauty to be used as decorative pieces in the home. Using the safety scissors, cut out eyes and a mouth on the paper plate. These cut-outs do not necessarily have to be the traditional shapes: oval for eyes, half-moon shaped for a mouth. They can be round, square, or triangular. This is a warrior representation. Use your imagination. Color the back side of the paper plate with your crayons, pencils, or markers. The more colorful the mask, the better. Think of it as war paint. It's a status symbol. Gently curl the left and right corners of the plate inward to create a curved mask effect. It should fit loosely around the face. Cut a piece of thread long enough to run from one end of the paper plate to the other. This will loop over the ears and behind the head to hold the mask in place. It can also hold the mask in place on the wall for a decorative look. Tape each end of the thread to one side of the plate, and enjoy your African warrior mask! These woven baskets served a practical use in the day to day life of many different peoples. Traditionally, these baskets are woven with grasses and other materials. This very simply project uses a ready-made basket and markers to create a similar effect. If there is a glossy sheen on the basket, sand it lightly with a fine-grain sandpaper, so that the marker will adhere. Draw a pattern with the markers. Washable markers will work for this project, although the colors may fade over time. This project requires creativity, so consider what kind of basket you would like. Geometric shapes, straight lines, or large blocks of color all work well for this project. Alternating various colors, shade in the visible parts of your basket. If the basket is shallow, you may want to color the entire interior. For deeper baskets, the exterior may be the only visible part of the basket to color. Display or fill with toys or keepsakes. Traditionally, the people of African tribes made jewelry from the materials they had available, like elephant hair, hides, and gems and minerals indigenous to their area. This project uses vinyl or leather cording, available at many craft retail stores. This project is not appropriate for small children, who might swallow small objects like beads or pendants. Cut your cording two inches longer than the length you want your necklace to hang. For a young person, 14 inches is a reasonable length, so cut the cord at 16 inches. Beginning at one end of the cord, tie a knot one inch from the end. Measure another two inches and tie another knot. Each knot should be large enough that a bead cannot easily slip over it. Add two beads, and tie a knot after them. Measure out one more inch, tie a knot, and add two more beads. Tie a knot after them to keep them from slipping. Measure approximately three and a half more inches. This should bring you near the center of the length of cord. Tie a knot. Slip one bead, your animal pendant, and another bead on the cording, and tie a knot to secure the beads. Your pendant should be able to hand in the center of the cord, so you may need to slightly adjust your knots here. Continue working your way up the rope, tying knots and adding beads equal with the opposite side. Tie your final knot one inch from the end of the cord. This leaves room to tie the necklace on either side. There are many fun African crafts for kids that will not only serve to entertain children but can also teach them about a unique part of this continent's great history.